In this Photo Editing tutorial, we'll look at the similarities between two of Photoshop's most important image editing tools - the Levels and Curves adjustments. At first glance, the Curves adjustment may seem less like an image editing tool and more like something only a scientist would know what to do with, especially when compared with the much simpler Levels adjustment which we looked at earlier. Don't let it fool you, though. Curves may be extremely powerful, going far beyond what can be accomplished with Levels, but once you understand how it works, Curves is actually very simple. In fact, it's as simple as, well, drawing curves! 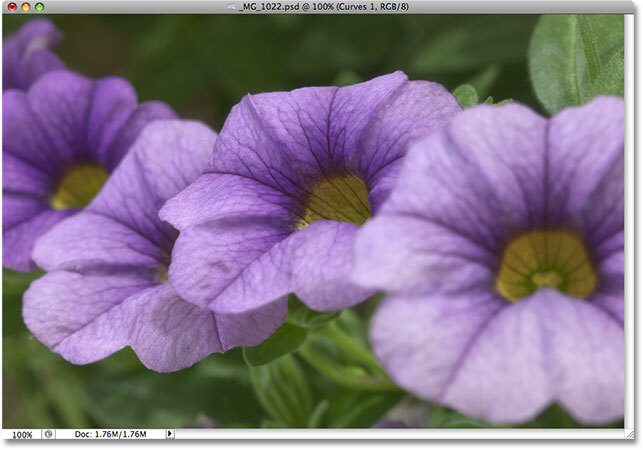 In this first look at Curves, we'll compare it with the Levels command to see just how similar the two really are. This will give us a good starting point for a more in-depth look at Curves later, including how the Curves adjustment has changed and improved in more recent versions of Photoshop (CS3 and CS4). You may want to read through the Improving Image Tone With Levels tutorial before continuing on if you're completely unfamiliar with Levels. It may also help to read through the How To Read A Histogram tutorial if you're unsure of how histograms work in Photoshop. As I mentioned, we'll save the discussion on the newer features of the Curves dialog box in Photoshop CS3 and CS4 for later. We're just going to look here at the basics of Curves and how it compares with the Levels command. For that, I'll use Photoshop CS2, but any recent version will work. The Histogram palette showing no real shadows or highlights in the image. Click on the New Adjustment Layer icon in the Layers palette and choose Levels from the list. The black point (left), white point (right) and midtone (middle) sliders below the histogram in Levels make it easy to fix the overall image tone. The Levels dialog box also contains a handy black-to-white gradient below the histogram, making it easy to see exactly where the tonal range of the image falls. The higher the spike in the histogram directly above a certain brightness level in the gradient, the more pixels we have in the image at that brightness level compared with the number of pixels at other brightness levels. If no part of the histogram appears over a brightness level in the gradient, we know that we currently have no pixels in the image at that brightness level. The current black, white and midpoint levels are listed directly above the histogram. Drag the black and white points to the left and right edges of the histogram to darken the shadows and brighten the highlights. What this means is that any areas in the image that were originally at a brightness level of 20 (a dark gray) have been pulled down to pure black. Any areas that were originally at a brightness level of 232 (a light gray) have been pushed up to pure white. The rest of the brightness values in the image have also shifted accordingly as the entire tonal range of the image is stretched to the full 0-255 range. The histogram now extends from the far left to the far right, indicating improved image tone. With the shadows darkened and the highlights brightened, the overall image tone has improved. The midtone, or "gamma" slider, lightens or darkens the middle brightness values in the image. A "before and after" view of the original (left) and corrected (right) versions of the image. Now that we've seen how easy it is to correct overall image tone problems with Levels, let's see how we can make the exact same corrections and more using Photoshop's Curves command! Use the Layer Visibility icon to temporarily hide layers in the document. Click on the New Adjustment Layer icon in the Layers palette and choose Curves from the list. This brings up the Curves dialog box. Again, I'm using Photoshop CS2 here since we're only looking at the basics of how Curves works. The Curves dialog box has a few additional features in Photoshop CS3 and higher which we'll save for another tutorial. The Curves dialog box appears at first to be nothing like the Levels adjustment. With no curves to be found, why is it called Curves? The reason has nothing to do with what you start with and everything to do with what you end up with. Curves is all about taking that straight diagonal line running through the grid and reshaping it into a curve! At first, the line is straight because we haven't yet made any changes. As we bend the line to create a curve (or curves), we make adjustments to the various brightness levels in the image. Before we get ahead of ourselves, let's first look at what it is we're actually seeing in the Curves dialog box and how similar it really is to Levels. One of the most obvious differences between the Levels and Curves dialog boxes, at least in Photoshop CS2 and earlier, is that Curves does not contain a histogram. In Photoshop CS3 and higher, Adobe did add the option to view the histogram inside the Curves grid, but I still find that the best way to view the histogram while working on an image is with the Histogram palette, since it gives you an updated view of the histogram as you're working. In both Levels and Curves (in Photoshop CS3 and higher), the histogram remains static, showing you only what the image looked like before making your adjustments, so you're really not missing all that much without the histogram in Curves as long as you keep your Histogram palette open as you're working. There are a couple of benefits to having the histogram displayed in the Curves grid, but nothing we need to worry about here. Curves contains two gradient bars, one along the bottom for input levels and one along the side for output levels. The points on either end of the diagonal line in Curves allow us to adjust the black (bottom left) and white (top right) points in the image. Let's see if we can use what we've learned so far about Curves to make the same basic tonal adjustments to the image that we made with Levels. To darken the shadow areas with Levels and set a new black point, I clicked on the black point slider and dragged it in to the left edge of my histogram. If you recall, this raised the black point from a default brightness level of 0 to level 20, which meant that any pixels that were originally at a brightness level of 20 were pulled down to pure black. We can do the exact same thing with Curves. To set a new black point, I simply need to click on the point on the left end of the diagonal line and drag it towards the right, just as I did with the black point slider in Levels. Since I'm using Photoshop CS2 and don't have a histogram displayed in the Curves dialog box, I'll keep an eye on the Histogram palette to see what's happening. Dragging the black point left or right in Curves is the same as dragging the black point slider in Levels. To set a new white point in Levels and brighten the highlights, I dragged the white point slider in to the right edge of the histogram, lowering the white point from it's original value of 255 down to 232. This pushed any areas in the image that were originally at a brightness level of 232 up to pure white. Once again, I can do the exact same thing with Curves. The point on the right end of the diagonal line works exactly the same way as the white point slider in Levels. I simply need to click on the point and drag it horizontally towards the left. Again, the Curves dialog box in Photoshop CS2 does not contain a histogram, but I can easily view the histogram in the Histogram palette as I drag the point. Dragging the white point left or right in Curves is the same as dragging the white point slider in Levels. The Histogram palette showing the same image adjustments after setting new black and white points with Curves. The same corrections to the overall image tone have been achieved using Curves. What about the midtone slider? We'll look at that next! What about the midtones? This is where Photoshop's Curves adjustment starts to get interesting. In Levels, we have a midtone slider that we can drag left or right to lighten or darken the middle brightness values in the image, but at first, Curves doesn't seem to have anything like that. We've already seen that the points on either end of the diagonal line are the Curves equivalent of the black point and white point sliders in Levels, but there are no other points on the line anywhere to be found. At least, not yet there isn't! Adding a new point in the center of the line gives us the Curves equivalent of the midtone slider in Levels. So far, we've been dragging the points either left or right. This changed the brightness level we selected in the image (the Input level) but left the Output level unchanged. Dragging the black point to the right allowed us to select every brightness value up to level 20 (the Input level) and force it down to level 0 (the Output level), while dragging the white point to the left allowed us to select every brightness value down to 232 (Input level) and force it up to 255 (Output level). For our midtone point, we want the exact opposite. We want to leave our Input value at 128 (or something close to 128 if you didn't click exactly in the middle) and change the Output level. We do that by dragging the point up or down! Drag the point up to increase the Output value, which will lighten the brightness level you selected, or drag it down to darken the brightness level. Drag the middle point up to lighten the middle brightness values or down to darken them. This takes any areas of the image that were originally at a brightness level of 128 and darkens them to a new level of 110. Notice that by dragging the middle point, our diagonal line is now bending into a curve (which finally explains why this is called the Curves command). The curve tells us that every other brightness level along the line is also being adjusted as we drag points around to reshape the curve. So even though we haven't actually selected any other brightness levels, they've all been affected to some degree by the adjustment. Whether you darken the midtones with Curves or Levels, the result is the same. At this point, we've seen how we can accomplish the exact same basic tonal adjustments with Curves that we can with Levels. We can drag the black point in Curves to darken the shadows, drag the white point to brighten the highlights, and add our own point in the middle of the line to lighten or darken the middle brightness values. You may be wondering what the big deal is with Curves if we can make the same adjustments with Levels, especially when Levels seems so much easier to understand. Well, the big deal is that we can go even further with Curves! A lot further! Levels gives us only three adjustments - a black point, a white point and a single midtones slider. Curves, on the other hand, gives us as much control as we want. We can add up to 16 individual points along the curve for pinpoint accuracy when adjusting brightness values! Adding a fourth point in the darker tones gives us even more control over the shadow areas in the image. Adding a fifth point in the lighter tones gives us more control over the highlights in the image. Any existing points can be re-adjusted at any time by clicking and dragging them as needed. Shaping the curve into a letter S is a common way of adding more contrast to an image. Depending on the image you're working on, you may be able to lighten the highlights and darken the shadows even more than I've done here, creating a more pronounced S curve. In my case though, increasing the contrast further would have made the image look too harsh, so I made only minor adjustments. Change the blend mode of Levels or Curves to Luminosity to avoid increasing color saturation. The color saturation has returned to its original level. And there we have it! That's our first look at Photoshop's Curves command! We've seen how to make basic tonal adjustments to an image with Levels, how to make the same adjustments with Curves, and how we can then go even further with Curves by adding additional points to the shadows and highlights. We've also seen how to limit the effects of the Levels and Curves commands to just the brightness levels by changing the blend mode to Luminosity. We'll continue to explore the full power of Curves in more tutorials, including a look at the added features available in Photoshop CS3 and CS4.